(E. Nezry, M. Leysen, G. DeGrandi, "Speckle and Scene Spatial Estimators for SAR Image Filtering and Texture Analysis", Proceedings of SPIE, Vol.2584, pp.110-120, Sept. 1995). 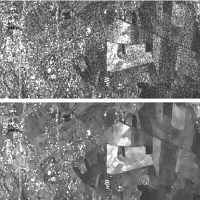 (A. Lopes, E. Nezry, R. Touzi, H. Laur: "Structure Detection and Adaptive Speckle Filtering in SAR Images", International Journal of Remote Sensing, Vol.14, nr.9, pp.1735-1758, June 1993). 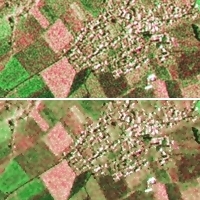 In addition, textural properties of the imaged scene are much better preserved: textured areas covered by forest are much better identified on the filtered image, and the useful spatial resolution of the radar sensor is preserved. Canadian C-SAR high resolution airborne SAR image (© Canada Centre for Remote Sensing 1987). With this new speckle filter, we are presently able to restore optimally the radar reflectivity and the textural properties of all possible imaged scenes.